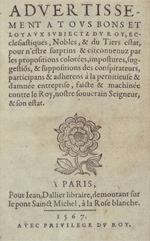 When I first began my career as a curator of Special Collections at BYU in 1975, I discovered the beginnings of a collection of pamphlets, printed in France during the period of the Religious Wars (1550) and through the reign of Louis XIII (1643). I was thrilled because I had served an LDS mission in France for two and a half years and had fallen in love with the history of that wonderful country. As part of my job description I was fortunate to be the curator and the cataloger of that collection. By 2014, there were over 2,300 pamphlets in the collection. I quickly noticed that with almost every pamphlet, the book dealer from whom we had purchased most of these French political pamphlets had provided a short explanation. The dealer was Leona Rostenberg, of Rostenberg & Stern in New York City, a truly remarkable rare book scholar. I felt it a waste of her erudition to not somehow save her lucid and succinct descriptions. So in 1980 I embarked on formulating an annotated bibliography of all of these wonderful primary sources. I cataloged each pamphlet and used the cataloging record as the basis of the bibliography of the collection. I read each pamphlet, studied the history and context of each one, and used Leona Rostenberg’s descriptions as the heart of the annotations. It goes without saying that I amplified and clarified her descriptions into something that I believe will provide scholars with a good foundation of this exciting period of time in the history of France. The digital age, of course, has now allowed us to digitize each pamphlet. One can peruse the bibliography and link to the digital copy from there, or one can conveniently search the collection by date, keyword, title, author, or subject. I hope that, in some small way, this digitized collection will benefit scholars of French history everywhere.